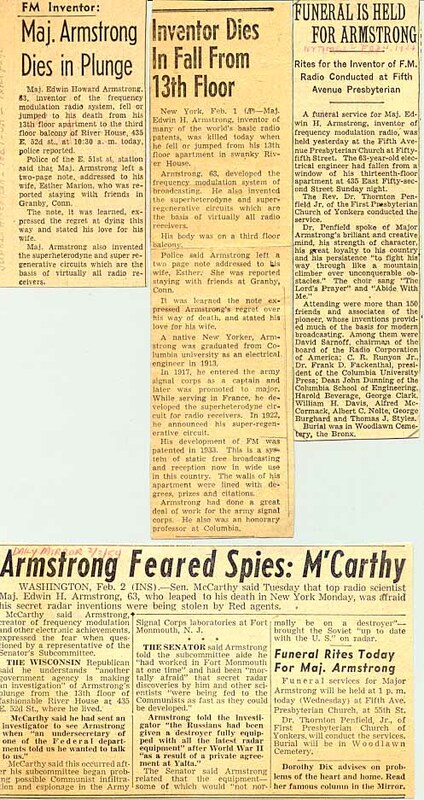 In 1945 Armstrong was dealt a blow by the FCC - FM would have to move from the established 44 - 50 megacycle pre-war band to a new band at 88 - 108 megacycles, to make way for television. More than half a million FM receivers and some 50 transmitting stations would be rendered obsolete. But the worse fear for Armstrong would be a loss of confidence in FM by the growing number of faithful hi-fi listeners. This move to higher frequencies, however, proved to be only a temporary setback for FM. By 1950 there were over 600 FM stations on the air and Armstrong had collected close to $2,000,000.00 in FM receiver royalties. The problem, though, was the personal cost of keeping his Alpine station on the air - and funding his research and staff. The money was leaving as quickly as it came in. The fact was that many companies were paying FM royalties (G.E., Westinghouse, Zenith and Stromberg-Carlson, to name a few), but R.C.A. and its licensees were not. Armstrong needed that income to continue his independent research and remain free of corporate control. 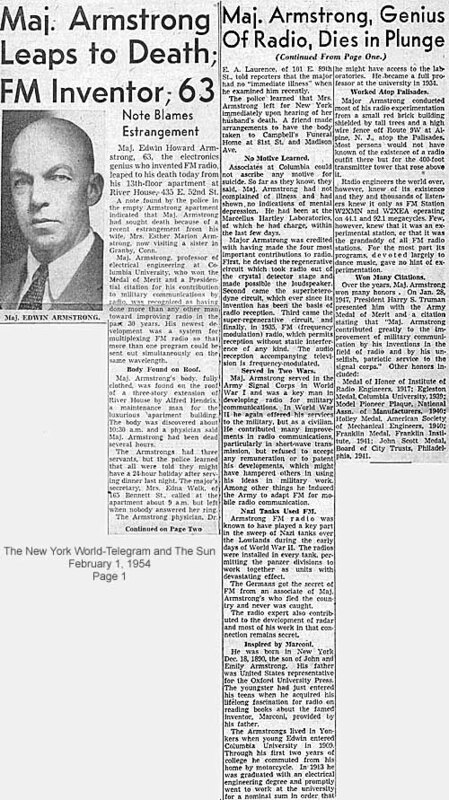 On July 22, 1948, Armstrong instituted a suit against R.C.A. and N.B.C. charging them with infringing his five basic FM patents. This suit would virtually dominate his life - and in fact would outlast him. 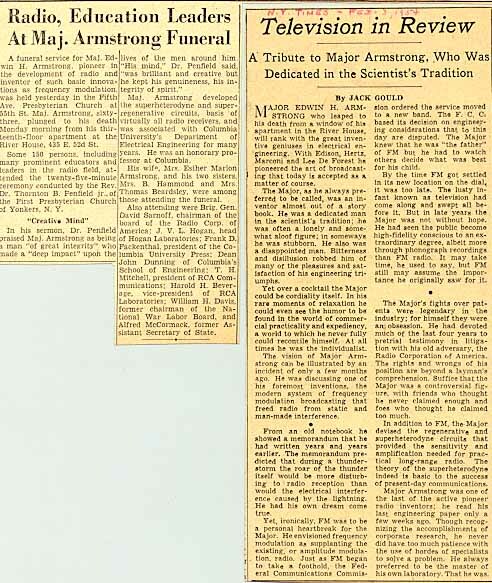 In November of 1953 it must have seemed to Armstrong that the world was closing in on him. Marion, his wife of 31 years, could not cope with this final war in the courts and his worsening personality, she left him for her sisters home in Connecticut. It was only later realized what dreadful condition his finances were in - he was facing a real catastrophe.